Gladiators do battle with big cats in Tiger’s Glory, an ancient Rome-themed video slot from Quickspin. This superbly designed 6 reel, 4,096 ways to win title delivers super volatile action, especially in the bonus round where you can win up to 26 free spins. Play on all devices from between 40p and £100 per spin. As usual for a Quickspin video slot, there’s no reason to gripe about the design here. The sound and visuals are superb. The setting is the mighty Roman coliseum. Flanked by marble columns, you’ll see A to 10 royal values as well as 4 gladiators in battle. The most rewarding symbol is the tiger. Land 2, 3, 4, 5 or 6 of these on adjoining reels, starting from reel 1, and you’ll win a payout of 1, 3, 5, 7.5 or 10 times your total bet. There’s also a wild that substitutes for everything bar the bonus. Tiger’s Glory comes with the Enraged Tiger’s Free Spins Bonus feature – look out for the sword and shield scatter to trigger it. Landing 3, 4, 5 or 6 scatters will get you 7, 10, 15 or 20 free spins. Joining the action in the feature is the enraged tiger symbol. If 1 of these lands, it will go into battle with an animated gladiator. If the tiger wins, it will lock in position for the rest of the feature. This first victorious tiger on each reel also adds an extra free spin to your total. In theory, you could end up with 6 extras free spins here and 26 altogether. All tiger symbols, both enraged and standard, pay scatter style during the feature meaning they can appear on any reel and in any position. If you’re lucky enough to land multiple locked tigers here, the coins can quickly amass. This slight wrinkle to the Enraged Tiger’s Free Spins Bonus feature can deliver some big results. We found those free spins to be something of an all or nothing affair. This is a very volatile game so you could end up whiffing completely or take down a big chunk of change – up to 13,830 times your bet on every free spin! Quickspin video slots are usually a feast for the senses and that’s the case with Tiger’s Glory. The imagery is superbly done and the sweeping orchestral score gives the game a suitably epic feel. The ancient Roman theme is one of the most popular in the online casino world. Tiger’s Glory is a perfectly enjoyable addition. 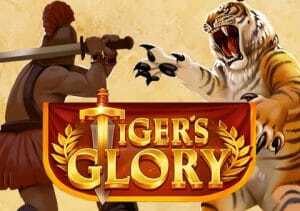 If you like the theme or just fancy playing a high variance title, then Tiger’s Glory should fit the bill. Alternatively, Gladiator Road to Rome from Playtech is recommend and is the official game of the iconic film.